Google has had this feature for years, but Microsoft has finally decided to integrate it into its own search engine. If you find an image on the web or have an image on your PC that you would like to “re-find” on the internet, you can use Image Match to do so. Let us say that you have a small image that you found on the internet a while back, you could now use Bing Image Match to find a larger and high-resolution copy of that same exact image. 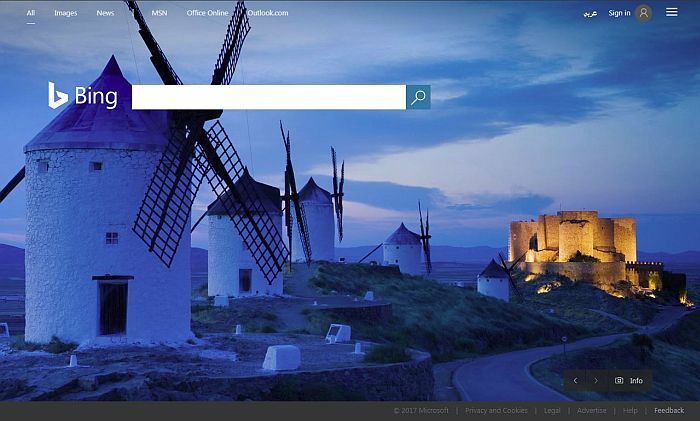 No playing around with search key words or Boolean logic – just point Bing to your picture and you are set. To use Bing image Match, simply head over to Bing.com and click on the “Images” tab. Then, next to the search box, you will see a button that says “Image Match”. You can either upload a file directly from your PC or paste in an existing image URL to start the search. You can type in simple equations such as “100 / 5” or “100 divided by 5” to get super-fast answers right inside Bing. The search engine now also provides a calculator that you can use to change around your math problem – not to mention, it is touch friendly. If you type something a bit more complex into Bing such as an equation like “y=2x+1”, then you will be provided a link to instantly redirect to Wolfram Alpha; the service will be able to plot your equation and provide other data surround the input. While Google may have had an edge up with image search functionality, Bing is still the king when it comes to searching video content. At times, while searching for videos on the web, it can be difficult to know if you are about to click on the correct video or a copycat. Bing eliminates any uncertainty you might have by allowing you to hover over any video and preview a short clip of it. If you are worried about accidently playing a “naughty video”, do not worry – Bing video hover disables itself and blurs any questionable content. In addition, when you play a video from a Bing search result, it will pop up within the page instead of taking you directly to the site. Not only does this provide an easy way to get back to your search results, but it also saves bandwidth by not needing to load an entirely new page each time. How many times do you want to look up a famous individual? Would it not be more convenient if when you searched “Henry Ford” a timeline automatically appeared with key events throughout his lifetime? With Bing Timeline – it does. Simply head over to Bing and perform a search for “influential or famous people” and you should be provided with a Timeline for said person. In addition, to the timeline that is displayed, you receive important stats up front including the person’s lifespan, family, and companies/organizations they may have founded. If your son or daughter (or yourself) has an upcoming school research project, using Bing’s Timeline feature is a great way to get them going in the right direction. Sometimes, you want to get information before you even hit the search button. Companies have tried various ways to accomplish this, such as Google’s instant results that searches and updates the page as you type. When Google released this feature many Bing users wanted something similar, so Bing came up with their own solution – Bing Snapshot. Bing Snapshot keeps everything a bit neater; instead of receiving entire search results for “Volca” when you are trying to search for “Volcano”, the features provides bits of information within the suggested search bar. If you are performing a search for “Bill Gates”, Bing will automatically provide you with a small “snapshot” of basic information that you can then click on to explore more about your query. Snapshots also include quick links to points of interest, such as news, imagery, biographies, quotes, etc. Here is a feature that most of you will not know about, but do not worry – it is because it is still in beta. Bing Saves is a new idea that the Bing team at Microsoft is testing out to provide easy bookmarking. Instead of saving your favorite bookmarks locally, you can keep them saved safe up in the cloud. To check out the new beta feature simply head to Bing.com/saves. From there, you will be able to pin a link to your favorite toolbar that will enable the ability for you to click and save a link directly to Bing. Your bookmarks can then be seen by visiting the Bing Saves section. We are not sure exactly how useful this feature is, as most browsers including Internet Explorer, Chrome, and Firefox already have cloud backups for bookmarks. That being said, maybe you can find an excellent use for the feature.